In the Indian Himalaya, Khardung La has its head in the clouds and its height in doubt. Is this really the world’s highest road pass? The sign at the top reads 18,380 feet (5602 metres) but some say that refers to the old mule track higher up. Measurements abound, with different results, but those who make it to the top stand firm. Give or take a little, ignore dirt tracks in neighbouring countries, and this is the highest motorable road in the world. Even the National Geographic Society has agreed, as did the Guinness Book of Records. 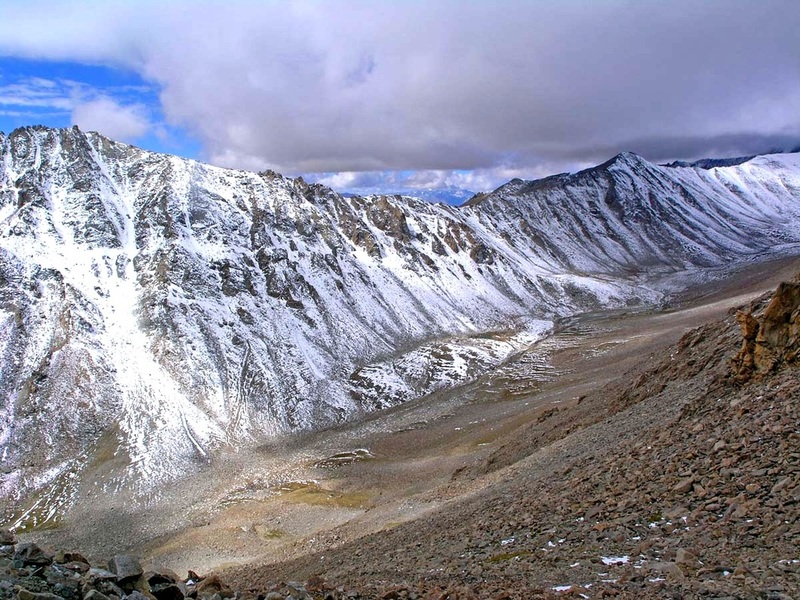 Once a permit has been secured in Leh, the drive begins with long leisurely zigzags waltzing back and forth across the barren slopes. Far below, the Indus river is just a scratch on the landscape, the oasis of Leh dwindles away and the mountain desert of Ladakh grabs you by the throat, like a snow leopard on a hunt. The South Pullu checkpoint is the last sign of human life except for bikers hungry for a challenge and truckers eking a living. After that, there is no turning back. 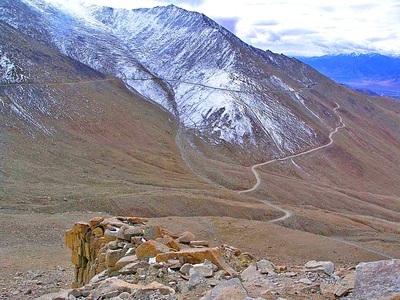 In this sensitive border area, the road from Leh to the Shyok and Nubra valleys over the pass is maintained by the army, no crash barriers but enough tarmac to call it a road and enough potholes to keep drivers on their toes. It’s wide enough for a truck and a bit, we only spot two over the edge, and traffic is one way, up from Leh in the morning, down after lunch. However, special permission can be granted to VIPs to bend the rules so it’s best to be prepared. 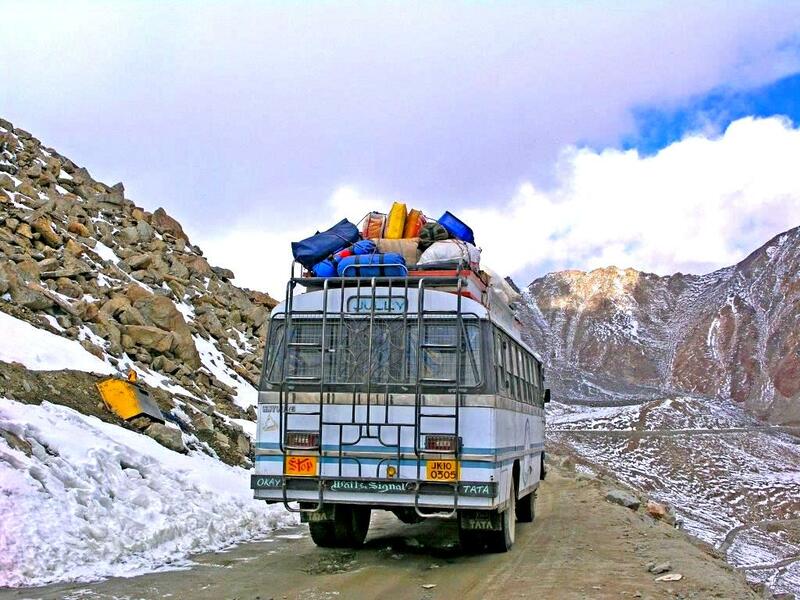 It takes a good two hours to cover the 23 miles from Leh to ‘K-Top’, unless a truck breaks down or snow begins to fall. Then you have lots of extra time to gaze at the precipitous drops, the boulders balancing above your head and the wilderness where even goats refuse to venture. There isn’t a tree in sight, just loose stones and shrivelled up lichen. ‘Always keep a cheerful attitude’, is the official advice so now and then a tinselled truck begins to honk and it feels almost like party time. Glaciers glint, peaks rise, jagged as a knife’s edge, and the first prayer flags flutter to wish you luck. Soon there’s a whole forest of them and you barely see the finishing line or the long awaited hut serving tea and hot noodles. It’s almost warm inside but you can’t come this far without climbing to the shrine on the hillock. ‘Avoid running or moving too fast, you have gained 7000 feet’. That’s a lot in two hours. 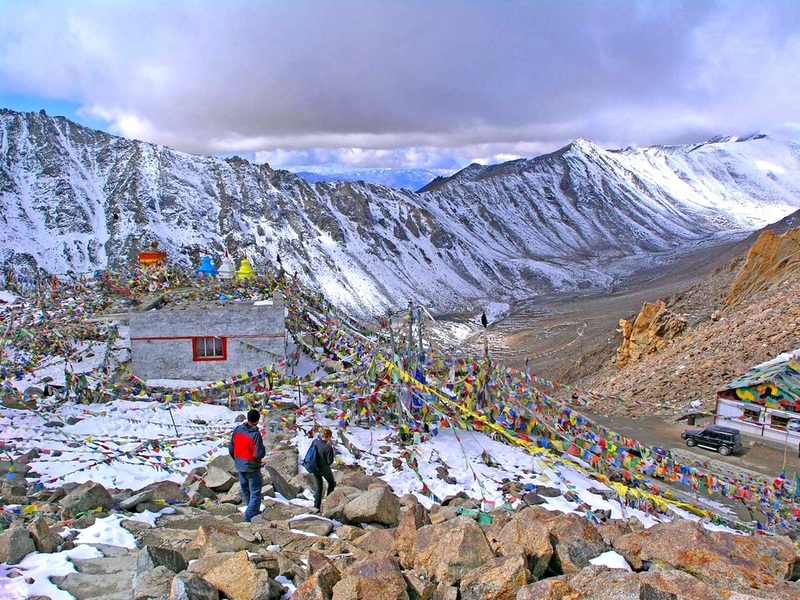 Steps, rocks, you scramble to the top, light-headed, struggling to breathe, but the views are worth every dizzying moment along the way, stretching right across the Ladakh range from the Zanskar glaciers in the south to the Karakoram in the north. The Nubra Valley spreads a golden glow into the distance, clouds come and go and an overloaded bus prepares to tackle a spine-chilling descent. We buy a souvenir mug in the army shop then head back down, an hour earlier than planned. No one seems to mind. Down there, the sun is shining and the marmots are out, frolicking all coppery gold on the rocks, including a couple on hind legs entwined in a last minute courtship dance before winter. They’re not worried about metres or feet, they’re just having a good time on the bleak slopes of Khardung La.